A legendary island of Peace and Sun.. Come and Visit Karimunjawa Island. Karimunjawa island located at the Java sea of Jeparas's sea west central java, Indonesia. Karimunjawa Archipelago is a National Marine Park composed of 27 islands, scattered 80km north of Semarang which is still offers the feeling of a natural and remote beauty. Karimunjawa was originally founded by Sunan Nyamplungan, sons of Sunan Muria, one of the 9th Moslem Saint (Sunan) who introducing Islam in Java. The name of Karimunjawa is taken from Javanese language 'kremun kremun saking tanah jawa' addressed by one of Wali Songo (the nine Saints who had introduced Islam in Java) to describe how far this mini archipelago from Java. Consists mainly of mangrove and beach forest, although there is some lowland rain forest on Karimun Jawa. Most of the island surrounded by sandy beaches and fringing coral reefs. Fresh water is confined to a few small wells and forest streams on Karimunjawa. A number of endemic animals live on the island while on the beaches sea turtles lay their eggs. The variety of the Karimunjawa sea's flora and fauna, includes of its coral reefs has made Karimunjawa as one of the National Marine Park in INdonesia. Many tour activities are possible to do there, such as hiking, sun bathing, camping, bird watching, swimming, snorkeling, riding banana boat, underwater seeing with the glass boat and also fishing. Besides that, the traditional ceremony of the uniquely Bugis marriage becomes another tourist attraction in Karimunjawa Island. 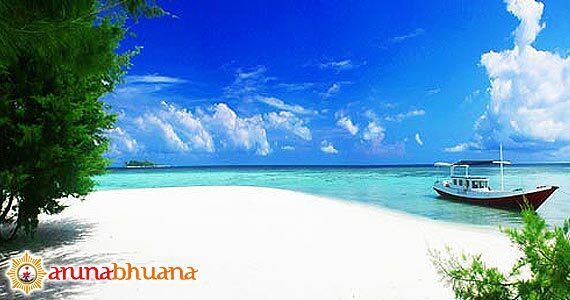 Most of the beaches in Karimunjawa Islands are white sandy beaches. Here you will be free for leisure and relax while swimming, sunbathing, and snorkeling. From 27 islands in Karimunjawa, there are 5 islands that are perfect for diving, snorkeling and fishing. For you who are attracted for swimming or snorkeling, you can visit the Tanjung Gelam, Menjangan Kecil and Cemara Kecil Island. You who prefer for sunbathing, the comfort places to visit are white sandy beaches in Menjangan Besar and Cemara Kecil. To see the marine life of the Karimunjawa Islands, you can visit Gososng Cemara and Burung Island by rent a fisherman's boat. Another activities are hiking and camping specially in Karimunjawa and Kemujan Island. The visitor can also see the Grave of Sunan Nyamplung. He was the leader in Karimunjawa Islands, a historical place where the first Dutch Ship landed. To visit every islands, the visitor can rent a motorboat. The Most wellknown handicraft in Karimunjawa is the wood carving. We can finds many gift shop that's sell many kind of wood carving. Many people also go to Karimunjawa to finds the Dewandaru Plant. They belief that Dewandaru plants can make their life longer. The Main village of Karimunjawa has a handful various kinds of accommodation there : hotels, villa, resort, homestay, and guesthouse. There are also camping sites there. Easists is to get the faster Kartini I, leaves from Tanjung Mas Sea port Semarang at 9 am on Saturday and returns at 2pm Sunday from Karimunjawa. It’s an air-conditioned fast boat with capacity of 168 passengers. Travel time from Kartini pier, Jepara to Karimun Jawa is 2.5 hours drive, while from the port of Tanjung Emas Semarang is a 3.5 hour drive. The Muria sails to Karimunjawa from Kartini harbour in Jepara on Wednesday and Saturday at 9am, returning from Karimunjawa on Monday and Thursday at the same time. There also chartered plane from Ahmad Yani airport Semarang that flies to Dewandaru Airport in Kemujan Island.